It's a while since I've needed to make birthday cards for babies or toddlers, so it was lovely to make one for my friend's little boy Henry, who happens to have the same birthday as my hubby. The challenge at Simon Says is, appropriately, Animal Antics. Penny Black stamps: Longing and Roar stamped in Versamark Onyx Black and coloured with Tombows. Lettering is Sizzix Sizzlits Girls are Weird. No. 1 is cut from a template. Happy Birthday is from Craftwork Cards. Love the bright colours (and those funny animals). Thanks for all your kind comments - if you don't have ring stamps to make the bubbly card, look through your alphabets at your 'o's - I used at least one of them! Can't wait to see what you come up with! Shirley, this is so adorable!! 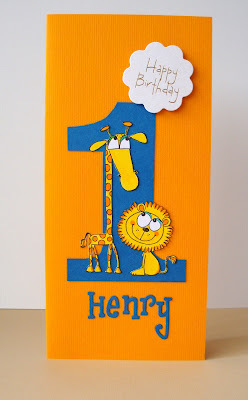 Love the bright colors ... and the giraffe and lion are super cute!! 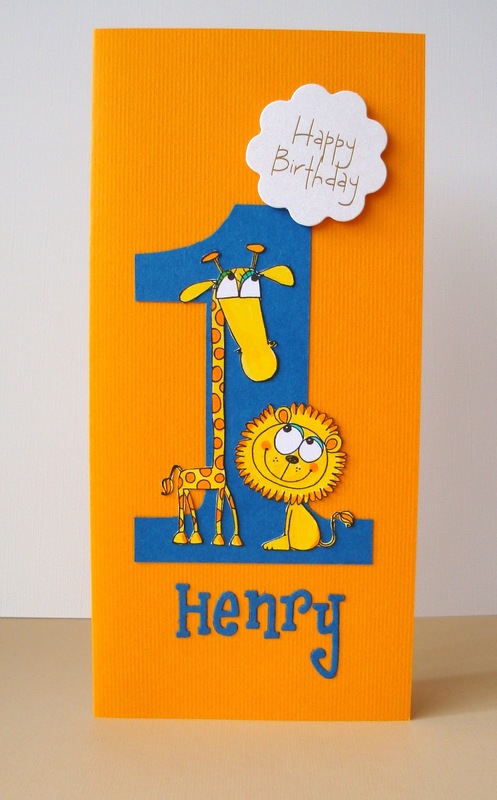 I'm sure your friend will love this card for Henry ... such a wonderful keepsake for her to add to Henry's baby book! Oh, for heaven's sake, how adorable, Shirley!! And, of course, I'm partial to the name Henry anyway. Fab card, even better in the flesh!!! Thanks Shirley. So very cute!! Love the big 1 and the cute animals! Perfect 1st birthday card!! Cuddly cute!! Love the bright yellow and blue combination! How fun to turn one with this card!